I've seen this technique going around a bit at the moment and really wanted to give it a go! I really love the effect that it gives and it really is quite easy to achieve. Bokeh is a term quite often used in photography. 1. the visual quality of the out-of-focus areas of a photographic image, especially as rendered by a particular lens. If you click here you will be able to see some fantastic examples of the Bokeh at work in photography. You can also achieve the 'Bokeh' look in your cards too! And it's not as hard as it looks! This was my first attempt at this technique and I'm really quite pleased with how it turned out! I used this clip here. Have a look and give it a go and you will be pleased with how good it looks! 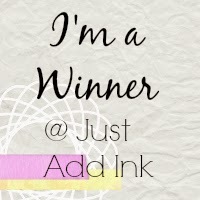 Just a quick post to say thank you to all over at Just Add Ink for choosing my card as the winning card this week! So excited! 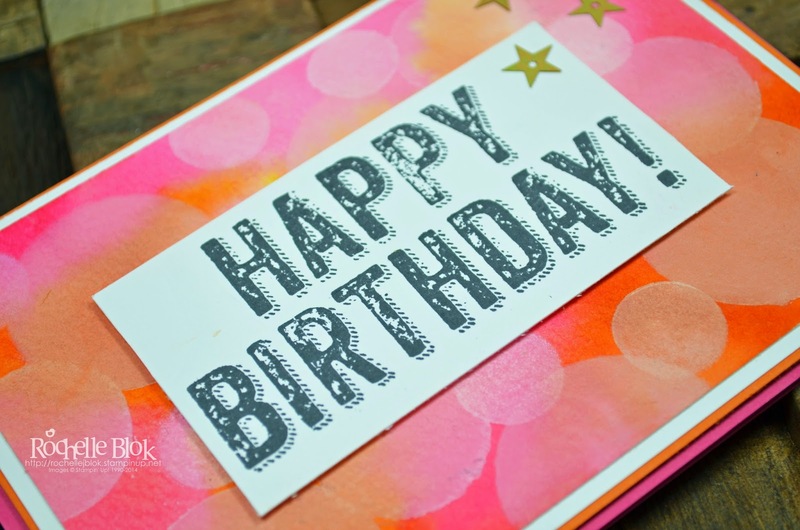 And this is my card! 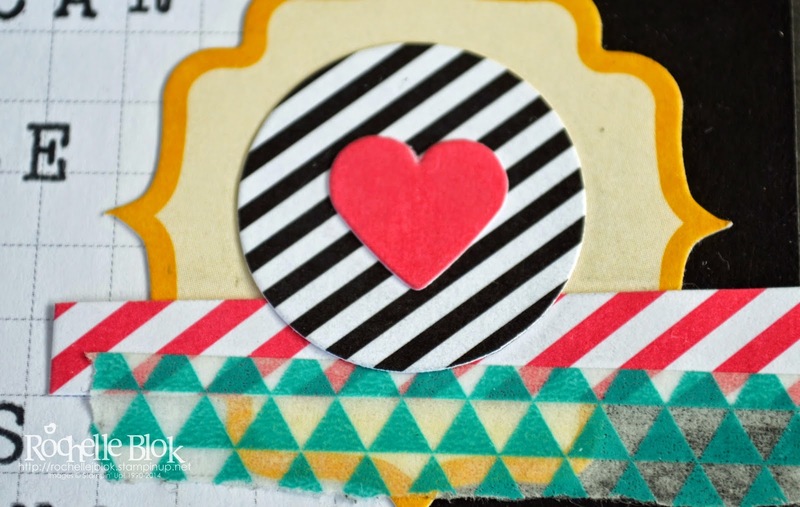 All the stamped elements on my card come from a stamp set called 'Choose Happiness'. I've had this set for a while now and have put a lot of thought into how I wanted to use this set. I loved it when I first got it and then once I got it home I thought 'How am I going to use this one'? 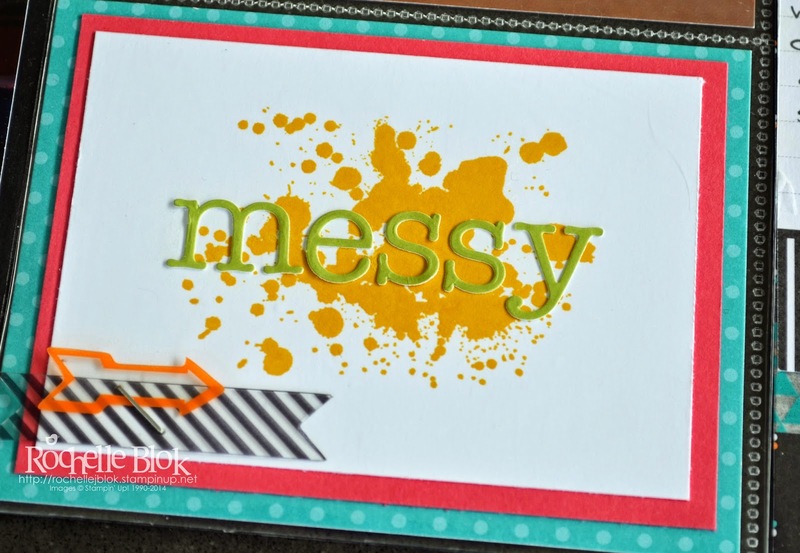 Let me just say when making this card I remembered how much I really don't like 'fussy' cutting everything! LOL! Sometimes though it really does call for everything to be hand cut! 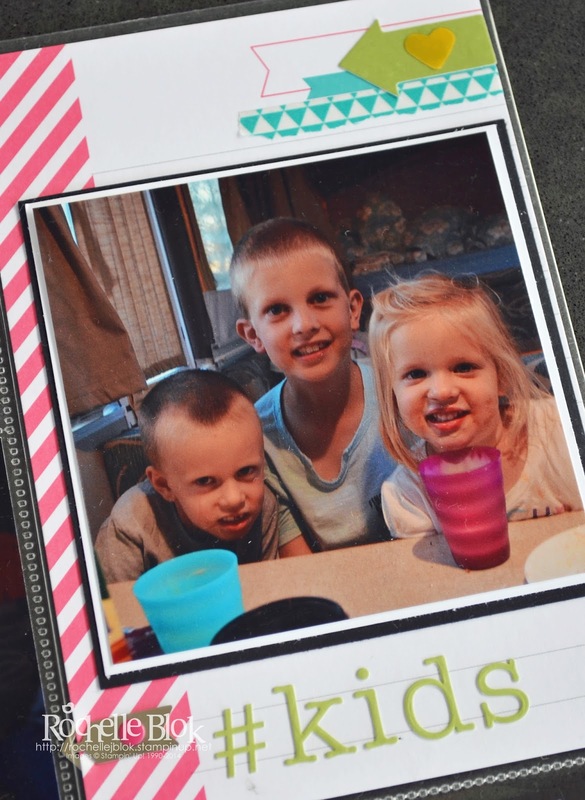 I'm so loving the Project Life® by Stampin' Up!® and its making it very easy to get some photos into albums again. 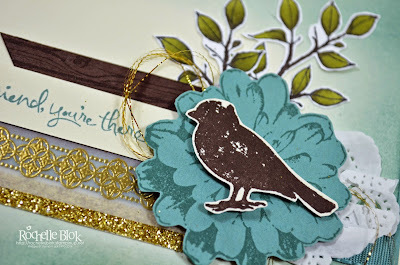 I started off as a traditional 12"x12" scrapper for a few years and then got into the card making because it's a lot quicker but now with Project Life® by Stampin' Up!® in no time at all you can have photos into a page, embellished, journalled and DONE! Too easy! I'm now up to the next page in my Holiday Album. I struggled a bit with this one with the way I wanted the photos to fit on the page. In order to get the photos to fit the way I wanted I cut one photo in half and put it into two pockets, one just slid in (with a little bit of embellishment, of course) and the other one I cropped completely because it originally was the wrong orientation. 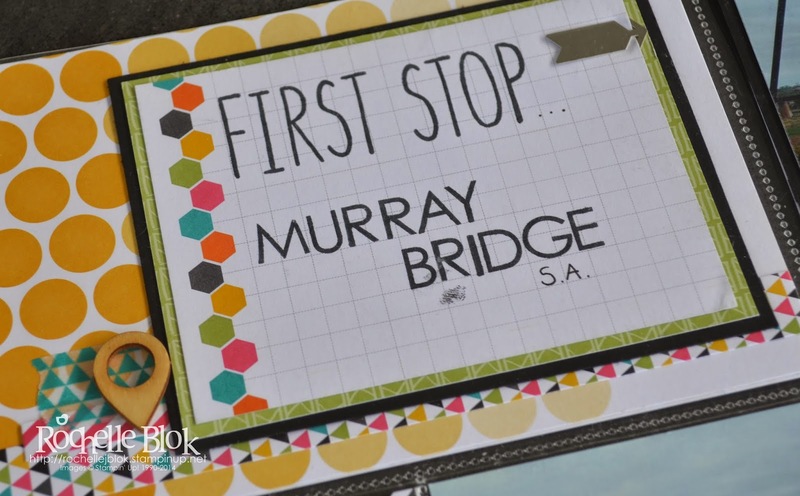 Instead of using an Alphabet stamp set for the title card I used the letter stickers. Lucky there was enough for the words I wanted. The card was finished off with some other stickers from the Everyday Adventure Accessory pack, some co-ordinating washi tape and some staples from the Stampin' Up! Stapler. I really love the dots on this filler card. 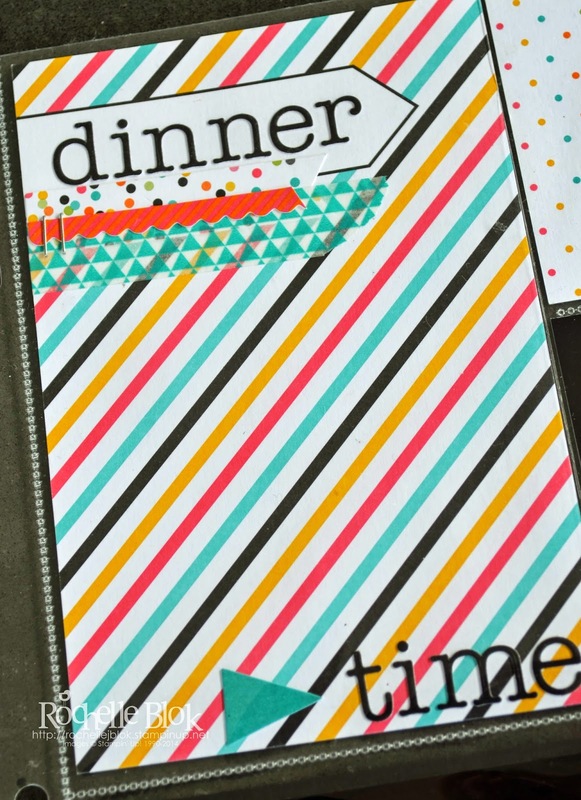 And I love the way its finished off with some chevrons from the Chevron Border Punch and an acetate accent stapled on. It's simple to do but looks very effective. Don't you just love that the letter stickers come in 2 colours. Just gives another option for different looks. Instead of trying to glue the acetate accents on it's soooooooooooo much easier just to staple them on and looks pretty cool too! Over the past few days we have had an unofficial long weekend here in Melbourne, Aust. Today (Tuesday) was the Public Holiday for the Melbourne Cup (The horse race that stops a nation) so a lot of people take the Monday off as well and make in a long weekend. 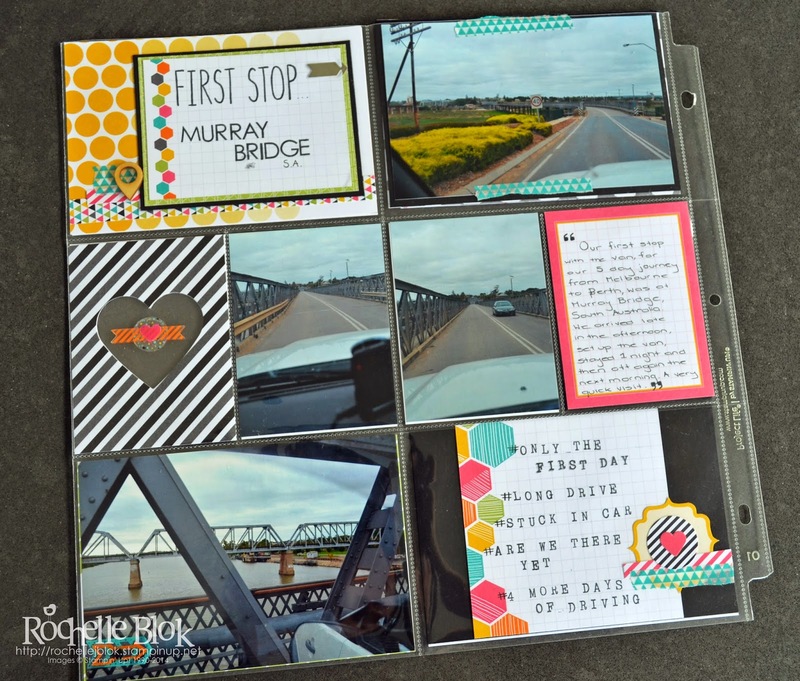 I decided that this 'long weekend' was a perfect time to do some more Project Life® pages (as well as having some family time as well). 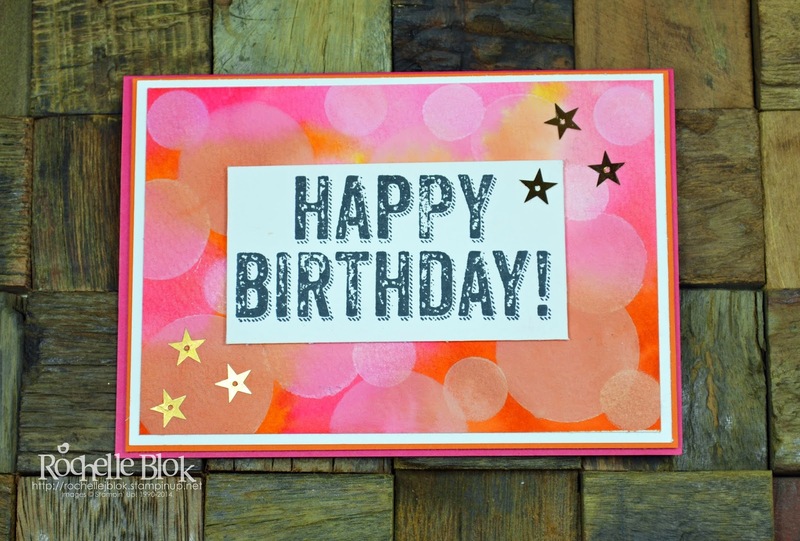 Project Life® by Stampin' Up!®. 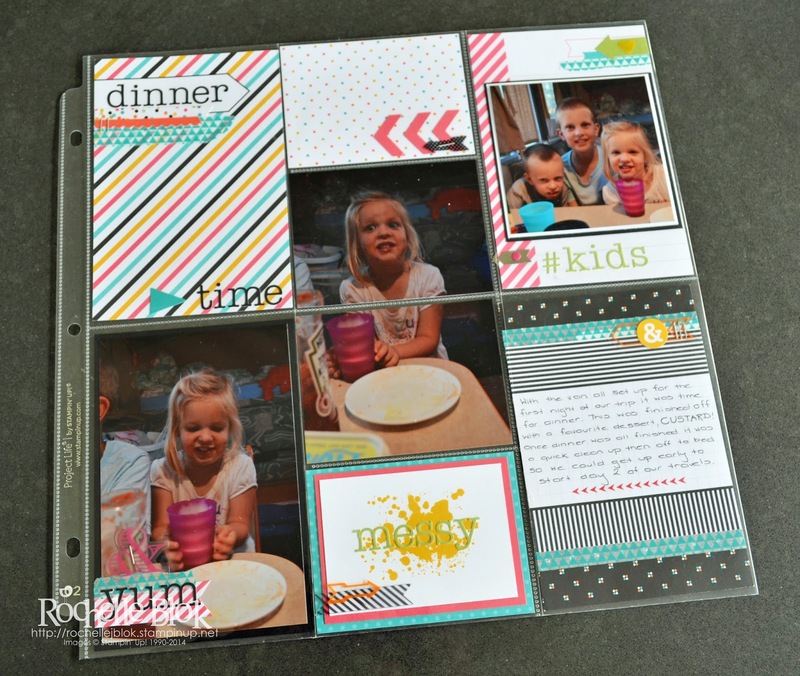 As in my last two pages I have used the Everyday Adventure Card and Accessory Kits. The title card I used one of the 4"x6" cards and then layered 2 different 3"x3" cards and then used some of the elements from the Accessory Pack to embellish the card. 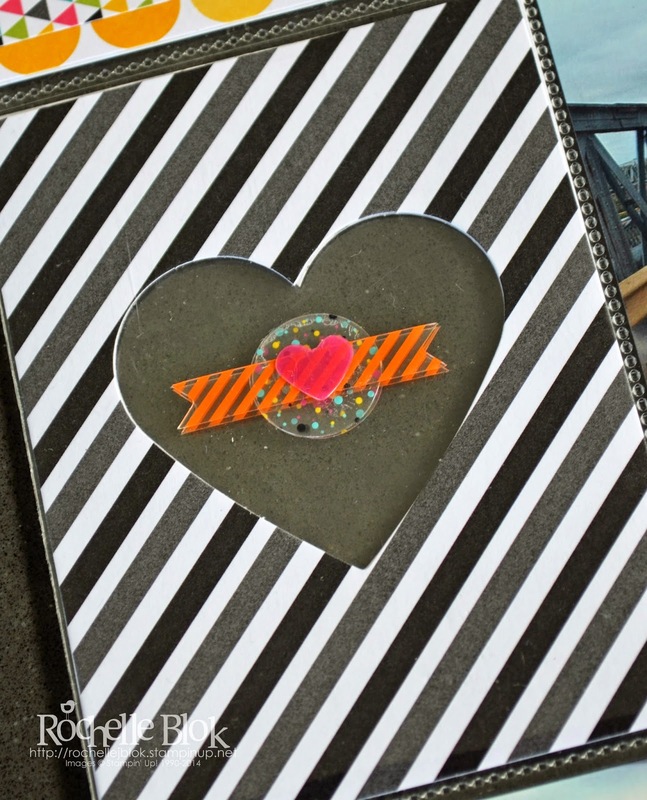 Because on the previous page I created a 'window' with the heart card I had to repeat the 'window' on the other side to keep the same look. I used the same acetate accents on both sides so that when you looked through the 'window' you would see the same on both sides. 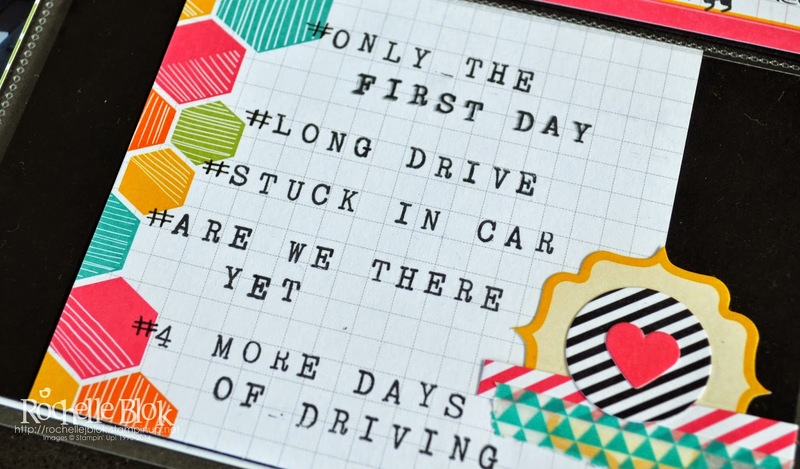 I layered on of the 4"x4" cards on some Basic Black cardstock and then used the Alphabet Rotary Stamp to create some hash tags and then finished off this card with some co-ordinating stickers and washi tape from the Everyday Adventure Accessory Pack. 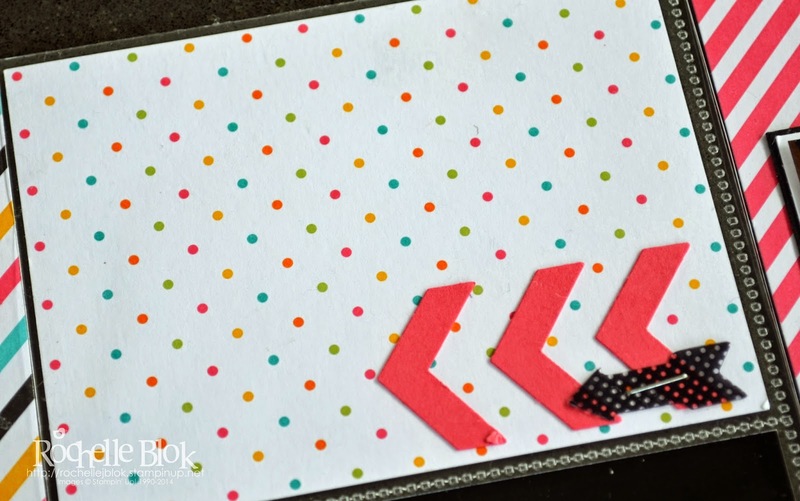 The accents from the Accessory Pack make it so easy to add embellishments to your Project Life® pages and the all co-ordinate with the colours from the card kit. 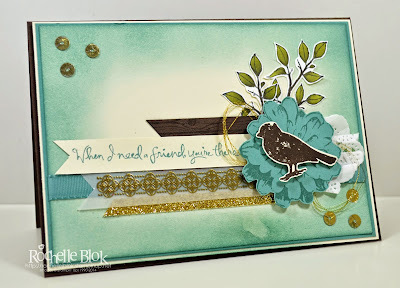 Watch this space for my next Project Life® page!